ON THE MORNING of August 6, 1964, thirty-year-old Donald Currey was leading several men up a trail along Wheeler Peak, the highest mountain in Nevada. One of Currey’s companions wore a U.S. Forest Service uniform, a second lugged a chainsaw, and a third carried a camera to document the event that would follow. They hiked through the thinning air for several hours, past clusters of piñon pines and Utah junipers. Eventually, the men reached the timberline, a point 10,750 feet high on the mountain, where tall plants yielded to the onslaught of nature’s winds and nothing survived beyond scrubby vegetation. There, on the environment’s edge, Currey’s team would encounter one of the world’s more remarkable trees, the bristlecone pine. And there, they would change five thousand years of history. The bristlecone pine is found only in the mountains of the southwestern United States at altitudes that sustain few other life-forms. The rugged environment sculpts the bristlecones into a dramatic, gnarled form, more horizontal than vertical, the physiognomy of an endless battle against the elements. On the wind-facing side, sand particles sheer away outer bark in a process called die-back. The wood beneath looks almost polished, as though it has been petrified alive. John Muir, the eminent naturalist, wrote that the bristlecone “offers a richer and more varied series of forms to the artist than any conifer I know of.” The trees can grow up to thirty feet high and twenty around, but often maintain living needles in only a small section—an indoor Christmas tree’s worth of green—which produces the distinctive prickle-tipped purple cones that lend the conifer its name. In 1958 the bristlecone pine had created a giant measure of excitement within a tiny segment of the scientific community when a National Geographic article declared that the species produced the oldest trees on earth. Edmund Schulman, the scientist who wrote the piece, explained that he had used tree-ring dating—literally counting up the annual rings in the trunk—to identify multiple bristlecone specimens in California’s Inyo National Forest that were more than four thousand years old. The most impressive find, a tree containing 4,676 rings, was named Methuselah, a nod to the longest-lived figure in the Bible. The National Geographic article asserted that the oldest bristlecones were located “at the western limit of their range” where Methuselah grew, suggesting that Schulman’s biblically named discovery was quite possibly the world’s oldest tree. Schulman’s finding held great promise for a variety of reasons. Tree rings recorded climatic activity with remarkable precision—wetter years generated widely spaced rings, drier periods kept them close, and all trees in a given area corresponded. Consequently, these bristlecones were silent but scrupulous witnesses to several millennia of droughts, floods, shifting rivers, and retreating glaciers. Their rings offered scientists, specifically dendrochronologists (those who study tree rings), a chance to reconstruct the local climate to dates contemporaneous with the building of the Egyptian pyramids. Currey, a graduate student in geography, was hoping to exploit this relationship between trees and history. He wanted to develop a climatic timeline connected to glacier growth and rock settlements in the Southwest as far back as 2000 BCE. His research centered on geological features in eastern Nevada’s Snake Range, a mountain chain capped by the imposing 13,063-foot Wheeler Peak. Bristlecones near the range’s timberline held valuable data within the rings of their trunks. Currey’s research site was several hundred miles east of the Methuselah find. Thus, he anticipated finding only specimens much younger than those featured in National Geographic. During the summer of 1964, however, he stumbled upon something unexpected. A bristlecone stand in the national forest tract known as the Wheeler Peak Scenic Area appeared to contain trees as old as anything that Schulman had described. An eager Currey began to take samples of the trees using his twenty-eight-inch-long Swedish increment borer, a sophisticated hand tool with an aperture approximately the size of a drinking straw that removed a fragment of the trunk without causing permanent damage. Day after day, he scrambled over the limestone soil and the deposited rock that surrounded the bristlecones, carrying his notebook and Swedish borer alongside, collecting samples that he could later analyze under a microscope. Currey’s 114th specimen was the most spectacular that he encountered. He measured it as having “a dead crown 17 feet high, a living shoot 11 feet high, and a 252-inch circumference 18 inches above the ground.” Such a wide base would have required four men with arms outstretched to encircle it. Currey also noted that the tree’s bark, which was necessary for its survival, was only “present along a single 19-inch-wide, north-facing strip.” The winds and sand had worn away everything else. But the tree was alive and still producing its compact bunches of needles on a three-inch-wide shoot. Currey attempted to sample this tree, which he labeled WPN-114, but his borer broke. He tried again and damaged his reserve borer. Without equipment, he was suddenly stymied. This ancient specimen stood before him, its rings holding the secrets to several thousand years of climate change, and he had no way to study it, not with his borers, anyway. Shortly thereafter, on that August 6 morning, Currey led the cutting team up Wheeler Peak. When they reached WPN-114, the men took turns sawing away at the tree. Several hours later there was nothing left but an enormous stump. Currey brought the prepared samples to his microscope and began counting tree rings. Then he made a startling discovery. There were 4,844 rings, nearly two hundred more than in Methuselah. And WPN-114 had been cut down several feet above its true base, losing access to some of the earliest rings. The tree could have easily been five thousand years old. Schulman had been wrong about where the oldest bristlecones lived. Thirty-year-old Donald Currey had unintentionally felled the most ancient tree ever discovered—an organism already wizened when Columbus reached Hispaniola, middle-aged when Caesar ruled Rome, and starting life when the Sumerians created mankind’s first written language. The next year, Currey quietly published his discovery in the journal Ecology. The three-page article, written in the scientific passive voice, acknowledged that WPN-114 was the oldest tree on record but postulated that future research would yield many older specimens. However, the only thing that the future actually yielded was a growing controversy over why WPN-114 was allowed to be cut down in the first place. The forest ranger who had claimed that the tree held no interest for the public had been wrong. Conservationists knew about the bristlecones and had earlier named WPN-114 “Prometheus” after the Titan who stole fire from Zeus, gave it to man, and then suffered eternally for his action. These conservationists claimed that the Forest Service had acted recklessly in permitting the cutting. Stories that a member of Currey’s team had died carrying a slab of Prometheus down Wheeler Peak left some observers suggesting that the tree had taken a life to remedy the injustice. Several dendrochronologists attacked Currey as an ignorant graduate student who didn’t know how to handle a borer and had little or no scientific reason to fell this particular sample. Evidence supported both sides of the controversy, depending on which accounts were used, and new perspectives leaked out over the decades. As late as 1996, the Forest Service ranger who authorized the cutting wrote a memo to correct “the many rumors,” and Currey himself gave the occasional interview up until his death in 2004. The only facts that anyone seemed to agree upon were that WPN-114 was the oldest tree ever discovered and that Americans had intentionally killed it. THE DEATH OF Prometheus was a tragedy, something to reflect upon with disbelief. Some of us, the more environmentally inclined, may react with anger, even outrage, knowing that scientists discovered such a marvelous tree only to steal it with a hasty and arrogant hand. After all, nothing can bring the elder statesman of the plant kingdom back. Others among us, perhaps more than would admit it in public, may simply shrug. It was one tree hidden on a mountain almost no one visited, whose only distinction was having been there longer than logic would suggest, a literal freak of nature, a sideshow act in wood. There are plenty of other bristlecones. But to treat the felling of Prometheus in isolation misses much of the story. The controversy was not merely a localized battle between dendrochronologists, conservationists, and the men holding sap-stained chainsaws. It was a tiny chapter in a much larger narrative of trees and America, or trees and Americans, two members of the natural environment who are constantly acting on one another, and over time changing as a result. Trivial details in the Prometheus story represent important shifts in America’s relationship with wood, trees, and nature. Take the location of the tree, for example. Wheeler Peak Scenic Area was part of a national forest, a type of government-controlled land first created in the late nineteenth century. For much of American history, the idea that the government would control some of the forests seemed ridiculous, an affront to the spirit of individualism and private property that helped build the country. The controversy itself formed part of a long lineage of Americans realizing that they had abused their great renewable resource when it was too late. Sometimes, this awakening involved a single tree, like the Liberty Tree that the Boston patriots could not protect from the axes of the British redcoats. Other times, it was a single species, such as the American chestnut, which was once the mightiest forest tree and now is little more than a legend due to an imported disease. Often, it was an entire forest, like the white pine belts of New England and the Lake States, which fell victim to America’s logging industry. The death of Prometheus offers only the tiniest window into this rich and wide-ranging history of Americans and their trees. The tale of how they shaped each other over time is simply too large, too multilayered, too varied for any single bristlecone on a lonesome timberline in Nevada. This larger story, however, forms the subject of American Canopy. HOW EASY IT is to forget that much of American history has been defined by trees. Giovanni da Verrazzano, the first European to leave a detailed account of a journey to North America, marveled in 1524 that “the wooddes [were] so greate and thicke that an armye (were it never so greate) mighte have hydd it selfe therein.” He labeled this heavily forested land Acadia, meaning “idyllic place.” The trees, in his opinion, were the most useful thing the land had to offer. But to speak of timber or fuel or pulp is to flatten trees into a single dimension. They also provide sustenance: sap into sugar, seeds into nuts and fruits. Their foliage brings life to desolate landscapes, their roots stability to shaky soils. Finally, on a hot summer day, there are few pleasures that rival hiding in the shade beneath the boughs of a noble oak. Over the years, technology has obscured the vital role that trees have played in shaping society. Steel and plastic replaced timber. Coal and oil substituted for firewood. Digital screens are crowding out paper copies. Industrial food chains have left almost no one relying directly on the forests for dinner. Sometimes it seems like this was always the way, man’s dominion over nature. Americans interact with trees that have been circumscribed, commoditized. Our furniture is a thin veneer of wood placed over synthetic materials. The wooden supports of our homes are tucked away from view with drywall and vinyl siding. Forests are cordoned off in carefully delimited regions, far away from the cities and suburbs. The juice from the fruit of trees has been pasteurized and homogenized. This separation from nature makes it easy to forget just how important trees are to our lives today. Each year, the average American consumes roughly 250 board feet of timber, 200 square feet of plywood and other structural panel products, and 700 pounds of paper and paperboard. More than 2.5 million Americans hold jobs directly dependent on the country’s woodlands. Nearly 20 percent of the nation’s freshwater originates in the national forests. And these same national forests provide more than seven billion activity days for vacationers, hunters, fishermen, and hikers. But these are just the most obvious dependencies. Trees also provide raw materials for countless medicines, plastics, technological devices, and artificial food. Additionally, some believe that our trees will hold the key to the country’s future, as they have the past. Our illimitable forests, which extract carbon dioxide from the atmosphere and store much of it as wood and other plant matter, may provide an opportunity to combat global warming. The same is imagined of tree planting. Scientists are also working to develop new processes that might turn trees into sources of renewable energy. Thus, even as we have found many ways to replace trees, they remain as important as ever. 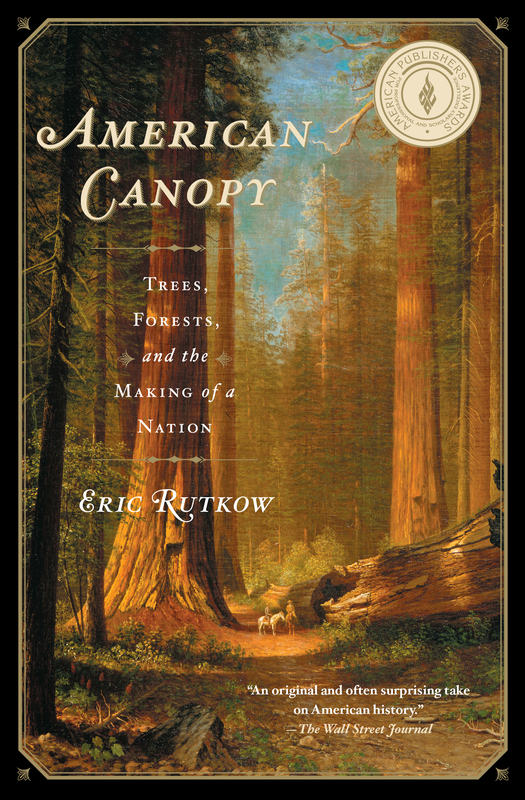 AMERICAN CANOPY explores this remarkable evolution. How trees changed from enemy, to friend, to potential savior. How forests morphed from obstacles to timber reserves to tree farms to sanctuaries of nature. How wood built the country, and apples united it, and trees imbued its great cities with life. How trees became part of the political calculus for westward settlement, as necessary as water and air, valued by settlers, speculators, surveyors, and soldiers. Americans started as people frightened of the woods, transitioned into a nation that consumed these woods for profit—along the way turning the tree into a lifeless, deracinated object—and finally arrived at the present point. Today, few of us understand where timber comes from or what to call any given tree species, but most of us share a sense that to destroy trees is to destroy part of ourselves. This story is uniquely American. No other country was populated because of its trees quite like the United States. Nowhere else has the culture been so intimately associated with wood. Entire states were peopled specifically for their trees: lumbering in the Northwest; orange growing in Florida and Southern California. Such great American cities as Chicago, Los Angeles, Miami, and Seattle would have looked completely different without the early commercial opportunities that trees provided. The industrial advance of the late nineteenth century—America’s great surge forward—may have been exploiting steam trains, telegraphs, and electricity, but it depended on cheap, abundant wood for rail ties, fuel, buildings, and utility poles. The nation’s military might also owed its fair debt to trees, unsung heroes of both world wars—for forests were recruited alongside soldiers. And after World War II, when a fast-rising population needed new housing, it was cheap timber that allowed for the sudden emergence of the suburbs, where, it should be noted, a tree could be found in every yard. It is no surprise that trees would shape America more than other nations. After all, America has some of the most spectacular tree resources on the planet. Forests once covered almost half of the contiguous states, a staggering 950 million acres. The diverse geography across the country gives America ideal soil for almost any type of tree, from the palms of Southern California to the pines of New England. The United States is home to the world’s biggest trees (the giant sequoias), the world’s tallest trees (the coastal redwoods), and the world’s oldest trees (the bristlecone pines). The biggest single organism on earth is also a tree species—and is also American—a stand of quaking aspens in Utah, known as Pando; it reproduces clonally, weighs sixty-six hundred tons, and is tens of thousands if not millions of years old. American Canopy takes these magnificent American trees as its subject, but the story is most often one of personal drama. Americans, after all, are half the equation. The Sons of Liberty used a famous tree as a center for popular protest that helped spark the American Revolution. George Washington and Thomas Jefferson were avid horticulturists who traded tree specimens as they negotiated the Constitution—Jefferson even considered the introduction of the olive tree to South Carolina as one of his greatest achievements. John Chapman, a man most Americans know as Johnny Appleseed, sold his trees to settlers looking to establish residence in the Ohio Valley. Henry David Thoreau helped awaken a nation to the beauty of woodlands. John Muir then used his passion for trees and unbounded nature to champion the creation of national parks. J. Sterling Morton, one of the first settlers in Nebraska, tried to turn the Great Plains into a forest by creating Arbor Day. Later, President Theodore Roosevelt, with his close confidant Gifford Pinchot, struggled to save the great western forests from industrial ruin. And in the following generation, President Franklin Roosevelt—a tree lover if there ever was one—looked to the nation’s woody resources as a way to ameliorate the Great Depression. Each man’s story tells a small fragment of a much larger tale, a tale that becomes the story of America. This relationship with trees has been one of the great drivers of national development. It belongs in a conversation with other forces that helped to forge American identity: the endless frontier, immigration, democracy, religion, slavery and its legacy, the struggle for labor rights, the expansion of civil rights, and free market and state capitalism, to name a few. And like all useful cicerones, the trees show us a picture of America at its best and at its worst. History has lost or buried many of the episodes highlighted in American Canopy. To learn about trees is to discover a side of the nation’s past that is rarely told. No one has ever treated America’s trees in all their dimensions as a subject for historical study. Pieces of the story for certain, but not the story itself. Perhaps it is because trees have been so integral to American history that it becomes easy to overlook them. People notice the unusual, not the ubiquitous. Like so many Americans, historians are guilty of taking trees for granted. But trees are the loudest silent figures in America’s complicated history. MEANWHILE, Prometheus turned out to be one of the loudest trees of all, though only in death. With each year that passed and without the discovery of an older bristlecone, the tree’s reputation grew, as did the controversy over its cutting. The felling of Prometheus convinced conservationists to take a more aggressive stand to ensure that such ill-advised chain-sawing was never repeated. Donald Currey even became one of the foremost advocates for greater controls over the region that contained the bristlecones. These efforts helped to create, in 1986, the Great Basin National Park, a heavily protected area that includes Wheeler Peak Scenic Area. And today all bristlecone pines, standing or down, receive federal protection. Thanks to these measures the bristlecones can continue to fight their eternal battle with nature’s wind undisturbed and to silently record America and the world as they change. But for Prometheus, all that remains is an unmarked stump and a footnote in history. It is still the oldest tree ever discovered.